An audiobook is a recording of a book reading. They give slow readers an opportunity to experience texts that they may not be able to read and time poor people a chance to multi-task their reading. They are also used by some people to help them learn the pronunciation of words and names in the book. 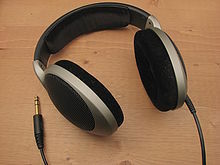 The following websites are archival libraries of free audiobook downloads. LibriVox is a volunteer run digital library with more than 4200 books in 33 different languages. The site was founded in 2005 when a blogger challenged his readers to help podcast a library of public domain books. LibriVox gives site users the opportunity to listen to a pre-recorded audiobook or to record their own reading for others to enjoy. Podiobooks is the home of the podcast novel, a type of serial novel where the book is broken up into episodes which are released at regular intervals. The books are provided for free by writers who are generally seeking more publicity for their work. Podiobooks sources readings from its own site and from iTunes. Open Culture is a cultural and educational website that provides fictional audiobooks as well as audio and podcasts on a variety of educational subjects, such as learning a new language. Visitors can also take advantage of free movies, ebooks, textbooks and online courses through the Open Culture website. Audiobooks For Free is a no frills site with a wealth of content. There are hundreds of titles available for download in fiction, non-fiction and children's categories. Users must register and log in before they can start downloading. If you never seem to be able to find the time to read, download a bunch of your favourite audiobook and take in Dickens, Conrad and the Bronte sisters while vacuuming the house or driving home from work. My wife and I spend a lot of time on the road, and with the magic of technology audio books have become part of these trips. We can download and then listen to them whilst traveling. There is a great variety available now. Great Blog.